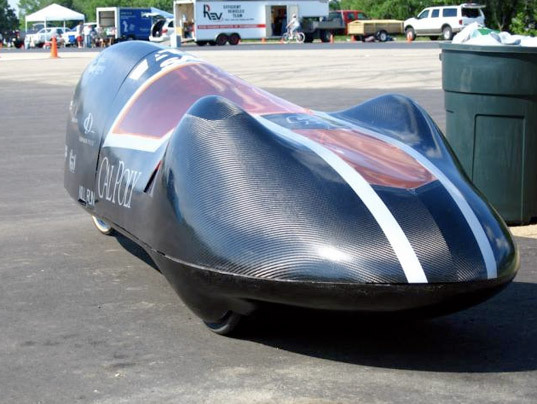 The Cal Poly Supermileage Team‘s wondercar, dubbed the Black Widow, has been under construction since 2005. The 96 pound car has three wheels, a drag coefficient of 0.12, a top speed of 30 MPH, and a modified 3 horsepower Honda 50cc four-stroke engine. It originally clocked in at 861 MPG and has been continuously tweaked to achieve the mileage we see today. Want to see the Black Widow in action? The car is being entered for a fourth time in the Shell Eco-marathon along with a new three-wheeled Urban Concept vehicle. Who knows? Maybe this one will break the 3,000 MPG barrier. Looks so fast, but I could outrun it sprinting on my bike. Gee, top speed of 30mph, running a 50cc engine? Whoopty-doo. It isn't even the least bit close to being a real car. i bet my old motorcycle would get great mileage too if i kept it to 30 mp/h. har. Think claims of electric vehicles that get over 200 MPG are impressive? 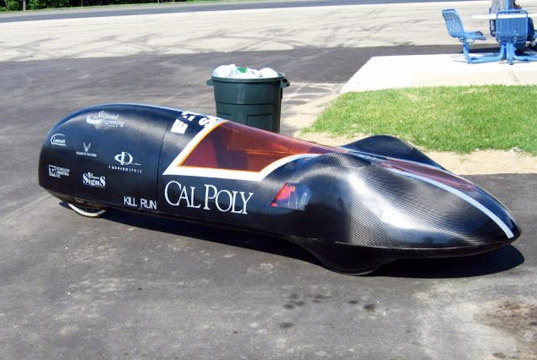 Try this on for size: a group of mechanical engineering students at Cal Poly have developed a vehicle that can get up to 2752.3 MPG -- and it doesn't even use batteries.